Kacie Rumsford died from a heroin overdose September 23, 2013. Her father Andy, right above, started Kacie's Cause to fight what he realized was a growing epidemic of drug use and overdoses. 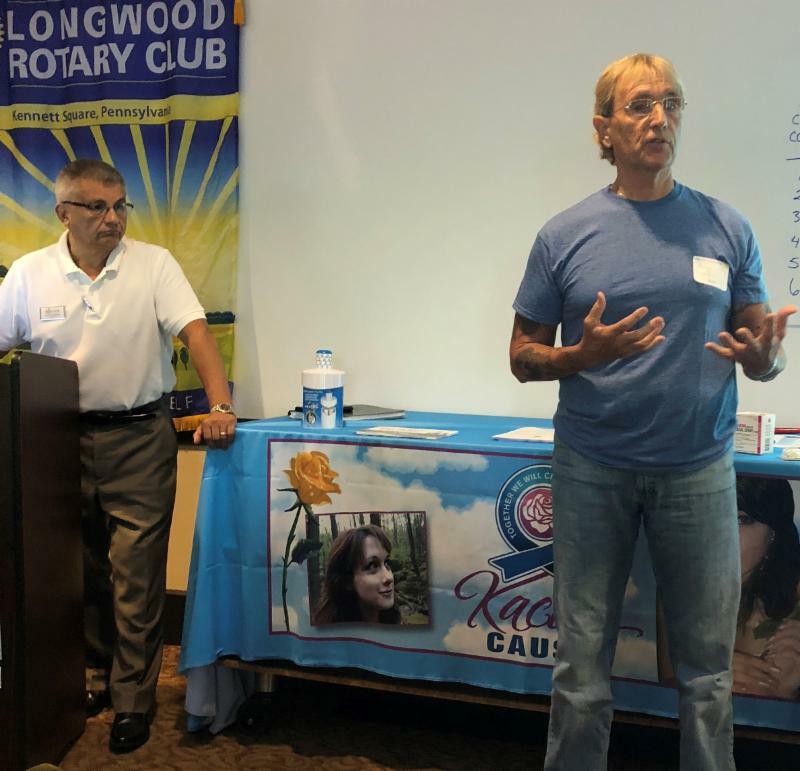 Through Andy and Luis Tovares, left above, tireless efforts, Kacie's Cause has started to grow rapidly, offering recovery, family and addict support, education and materials needed to save lives. Today there are 7 chapters with more in the formative stages. So far the area served is northern Delaware and the western suburbs of Philadelphia. Kacie's Cause works with school systems, YMCA's, colleges and holds town hall meetings to educate people about this epidemic. Slowly people are realizing the scale of the issue and participating in trying to control it. The goal is to make everyone aware of the risks, how to recognize and help family members abusing drugs and if/when they overdose using Naloxone to save their life. Andy thanked Matt Grieco for his help in the education area as Matt counsels families who have lost someone to the epidemic. Working with the Chester County Drug and Alcohol Services department, Kacie's Cause has trained 900 people in administering Naloxone in Chester County, supplied them with this life saving kit, and have 300 more kits they are hoping to distribute soon. Kacie's Cause is now working to set up a recovery house in the Kennett area. Recovering addicts need help because they have no social life outside the drug world. Usually everyone they know except family are also drug users. This makes relapse highly likely. A recovery house and/or community centers would minimize this barrier to recovery by providing a social life and peers to help them through the recovery process, which will last a lifetime. Services are provided to impacted family members. They need to learn what to watch for to minimize the chance of a relapse, and if they lost someone they need knowledgeable grief counselling. Strong support groups mean strong programs in the community to counter the allure of drugs. Programs offered include many targeted on giving teens a safe place to go and activities to do, plus build self esteem. They include providing prom dresses to students for free or a nominal fee, a skate park has been opened in Parkesburg. There are now 2 scholarships being awarded to high school students. Colleges are starting to define themselves as "sober schools". This means they provide recovery support programs, dorms where no alcohol is allowed and non-alcoholic parties. The most frequent route into opioid addiction starts with prescription pain medications stolen from the family medicine cabinet. When pain medicines become too expensive or hard to obtain, the abuser moves on to 12 times cheaper heroin. To reduce the chance to start abusing, Kacie's Cause is distributing free "pill boxes" as a safer place to store medicines. Recovery support programs are funded by donations and car shows in Downingtown, Morgantown and Bloomsburg. A grant writer is being sought now so the rapid growth in programs and geographic reach can be sustained.